A Knighthood or a Damehood is one of the highest honours an individual in the United Kingdom can achieve. How would you like to be addressed as Sir or Dame amongst your peers? Or be able to use your new title to fill in forms, opposed to using the standard Mr and Mrs? Becoming a Sir or Dame comes with joining an elite class with the likes of Sir Bill Gates, Sir Paul McCartney and Dame Angelina Jolie. The word Sir is a variation of Sire, an honorific term used throughout Europe alongside Seigneur, which was used to refer to a feudal lord. The term Sir was first used in England in 1297, being used as the title for a Knight. The title Dame as the female equivalent to a Knight wasn’t introduced until 1917 (although of course there were female Knights before this). The Knights of the Sovereign Military Order of Sealand were originally created from a select group of people after the 1978 invasion to defend and protect the Principality of Sealand. After the passing of Prince Roy it was decided these titles were to be available for the supporters of Sealand, people who want to protect and help sustain the micro nation. If you believe you can take on this responsibility, purchase your Knighthood or Damehood today. BECOME A SIR OR DAME! 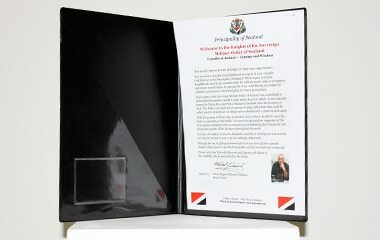 Not only will you be able to call yourself Sir or Dame, on purchasing your Sir title or Dame title you will receive a full title pack for your Knighthood or Damehood, included in this is a framed and personalised Individual Title Deed, the Sealand Knight’s Code Of Chivalry, an elegant official documents folder to keep your Sir or Dame Title in perfect condition, the history of Sealand and images of the Principality of Sealand and the Royal Family. The optional extra of owning a piece of Sealand Territory to complete your Sealand Knighthood or Damehood will help to keep Sealand’s independence for many years to come. 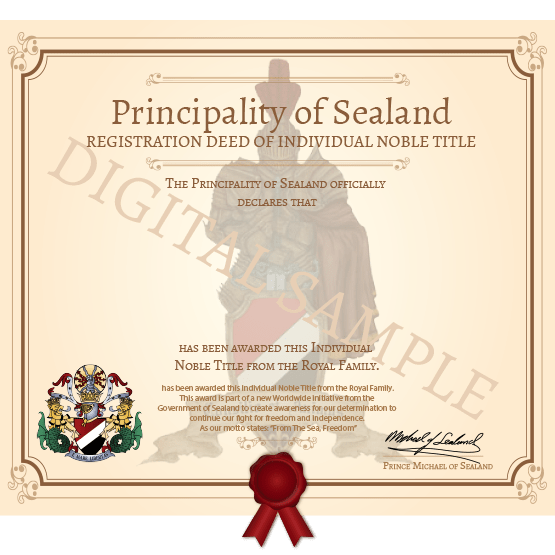 In addition to your Sir or Dame pack and securing your place in Sealand’s Royal Peerage, you will also receive a Property Title Certificate to a square foot of Sealand territory, making you a true part of Sealand. 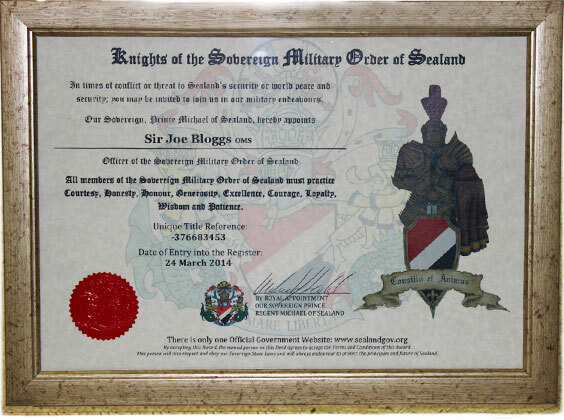 To become a Knight Of The Sovereign Military Order Of Sealand is a fast and simple task and we can soon issue you with your Sir Title or Dame title as soon as possible. This is the perfect gift for the person who has everything, a unique and special idea. Or for yourself if you believe you are deserving enough for a Knighthood or Damehood. Do Sir Or Dame Titles Expire? All of our royal titles including both Sir titles and Dame titles have no expiration date, making you part of Sealand for your entire lifetime. No matter where the location, all of our Duke or Duchess titles will be delivered within 5-10 days. This includes the USA and Australia. We email a PDF version to all of our product orders. This means you will be able to access your Sir or Dame title immediately. Ideal for when your gift won’t arrive in time for a birthday. What Does The Standard Sir Or Dame Title Pack Include? 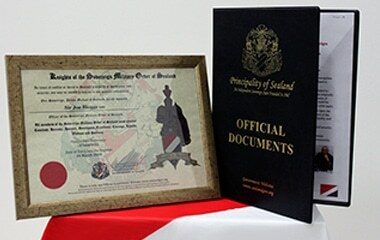 The Sir Or Dame title pack includes a framed and personalised title deed, the Knights Code Of Chivalry, history and photos of Sealand and an official documents folder. What Does The Premium Sir Or Dame Title Pack Include? The Premium pack contains the additional extra of a personally signed deed by Prince Michael of Sealand. Is A Record Kept For All Sir Or Dame Title Purchases? All Sir titles or Dame titles purchased are stored in the Royal Register, but only the Sealand Royal Family have access to this register.